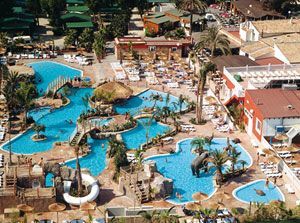 Information La Marina Hotels and local Accommodation La Marina Costa Blanca plus other local hotels and aparthotels. All elegant rooms at hotels La Manga Club Príncipe Felipe feature a private balcony with views of the pool or golf course. They are equipped with satellite TV and tea and coffee-making facilities, as well as a bathroom with a hairdryer. 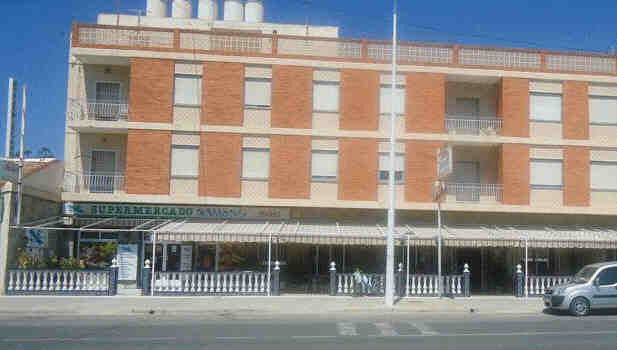 La Manga Club’s restaurants offer a variety of cuisines, such as Italian, Spanish, Asian, Indian, an American, among others. The Amapola Restaurant specialises in Mediterranean food, while La Bodega is the ideal place to enjoy typical Spanish tapas. The exotic specialities at Asia Restaurant in Las Sabinas offer a taste of south-east Asia, and Luigi’s goes beyond the Neapolitan pizza and delicious pasta dishes to provide guests a taste of the extraordinary wealth of Italian cuisine. Dharma Restaurant specialises in Indian cuisine, and is one of the most exotic options at La Manga. And last, La Cala Restaurant serves fresh fish and seafood in idyllic surroundings overlooking the Mediterranean beach cove that gives it its name. 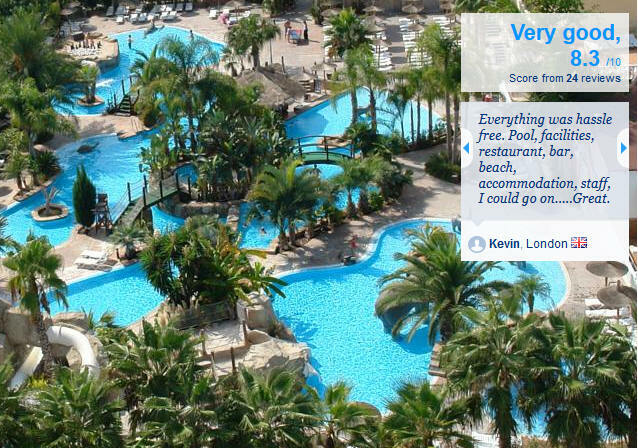 The La Manga Club has 8 football pitches and a private beach area located 3 km away. Guests have free access to the steam baths, gym, sauna and heated pool. The spa is located 3 km from the hotel, and there is a free transport service available. Marina Internacional, is the place to enjoy your well earned vacation. In a calm and comfortable ambience, in which you will enjoy the privileged location of our apartments in Torrevieja.Two minutes from downtown, Torrevieja, and also only a short step from the Acequión beach. The calmness of the Marina Internacional apartments, belies the fact we are situated close to the Costa Blanca’s most important tourist center. Our apartments accommodate up to 6 people, with air conditioning, fully equipped kitchen, with bedding, blankets, pillows and towels also provided. A television, washing machine and balcony furniture are included. The apartments are cleaned twice a week.All apartments have got a beautiful view to the Marina Internacional port, in which the private crafts are anchored, in addition, unbeatable views to the Acequión beach which is next to the apartments. In our complex you will find an agreeable and attractive environment, in which you may enjoy our large swimming pool, eating something in our restaurant, staying in the snack bar patio or taking a few drinks in the bar, all this is cheered up with music, karaoke, summer cinema, transmission of sports events (formula 1, football, motorbikes, golf, etc.) across our big screens installed outside. We also provide the service of 24hrs secured parking. The sandy beach at La Marina stretches some 17 kilometres from Santa Pola in the north to Torrevieja and Guadamar in the south. The Urbanisation is one biggest in the Costa Blanca and lies only approx. 3,5 km away from the wonderful sandy beach, situated about a mile back into the hills with many shops, bars, restaurants, swimming pools etc. The Spanish weekly markets are held in almost all towns close to the town itself they take place on Thursdays and Sundays near the centre, and on Sunday in Campo de Guardamar, the large market has numerous stalls offering fruit and vegetables, as well as shoes from the Spanish traditional workshops, craft work, clothes, leather article and many other items. La Marina is well situated for exploring the area with coastlines, mountains and wonderful scenery to enjoy. 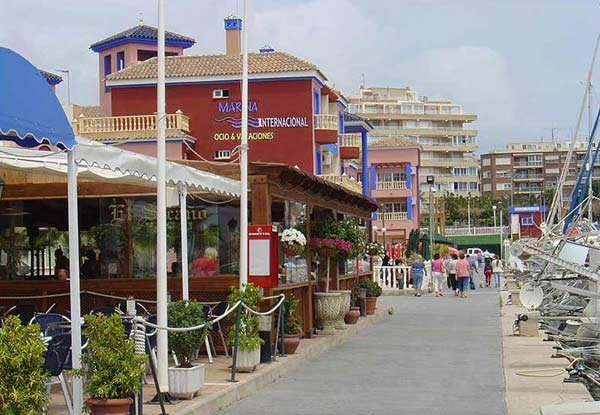 The old towns of villages of San Fulgencio, La Marina-Pueblo, Rojales, Almoradí, Crevillente, Dolores and Catral are close by and worth a visit.